Gloria Brown, of South Shore is the overall winner of the 2016 Quilt Show of the South Shore Quilt Festival. Brown is standing in front of her winning work. Tri State Mountain Dulcimer Society performed at the 2016 South Shore Quilt display. Left to right: Dan MaHoney, Sarah Blake, Billy Dewees, Linda Wallace performing at the South Shore Quilt Display. Handmade instruments and very entertaining. SOUTH SHORE, Ky. — The 2016 South Shore Quilt Festival has come and gone. The event director, David Piatt said it was another successful year. As far as the Quilt Show, Piatt said they have lost some regular participants, and hope to garner more participation from younger quilt makers. 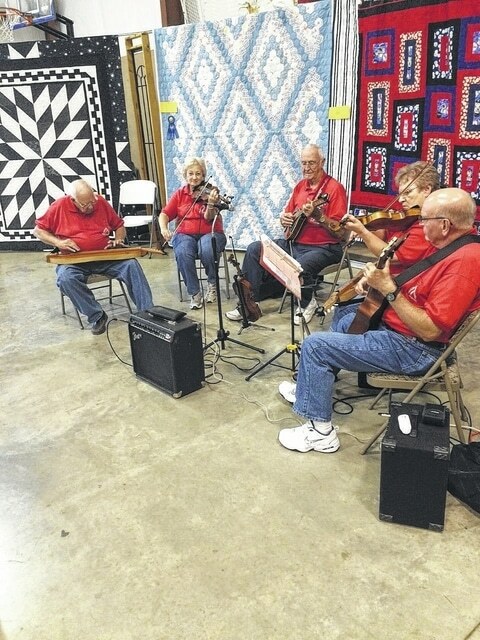 Quilt makers from Lucasville are a thriving group which have been participating in the Festival. Gloria Brown of South Shore, Ky., was the overall winner of the 2016 South Shore Quilt Festival. She said is thrilled about winning. “I was kind of surprised, and thrilled. My daughter suggested that I put something in, but I said, “I don’t know, but I’ve got that blue quilt, and she said, put that in,” Brown said. “So she encouraged me, and I decided to put the blue quilt in. Brown said it took a total of six months to complete the blue ribbon, first place quilt. Brown is already thinking about competing in the 2017 South Shore Quilt Festival. “There is a Christmas quilt that I would like to do, so hopefully I will have that ready this year, and will probably put that in the Quilt Festival next year,” Brown said. The South Shore Quilt Festival Committee is pondering ways to enhance next year’s event. Additionally, Piatt said the South Shore Quilt Festival Committee will be examining ways to to make more handicapped parking more accessible for the 2017 Festival.